Bestial is now available on Amazon worldwide! It’s the story of a Beauty and a Beast – only not as you know them. A young woman changed into a bestial creature, seeking redemption. Two twin brothers, one with all the emotional sensation and one with all the common sense – one balanced person, split in two bodies. Their lives and fates intertwine, and none of them shall escape unchanged, or unscathed. 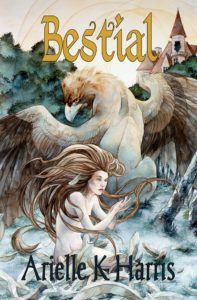 If you’re a fan of fairy tales, works of fantastic literature and discussions about what it means to be human then Bestial will take you on a familiar but unexpected journey. It takes the usual fairy tale archetypes and turns them around, and instead of ending with a “happily ever after” it’s more concerned with the “after” and exploring what comes next for the characters and their relationships with each other and themselves. I hope you enjoy reading my debut novel, and I would greatly appreciate if you would take the time to review the book on Amazon after you’ve finished. I welcome all feedback, so please write an honest and unbiased review – even if you didn’t like the book, please tell me why! This has been an exciting period of change in my life, and thank you all for being a part of it!